"I look about and find whatever I see / unfinished," Margaret Gibson writes in these powerful and moving poems, which investigate a late-life genesis. Not Hearing the Wood Thrush grapples with the existential questions that come after experiencing a great personal loss. A number of poems meditate on loneliness and fear; others speak to "No one"--a name richer than prayer or vow." In this transformative new collection, Gibson moves inward, taking surprising, mercurial turns of the imagination, guided by an original and probative intelligence. With a clear eye and an open heart, Gibson writes, "How stark it is to be alive"--and also how glorious, how curious, how intimate. 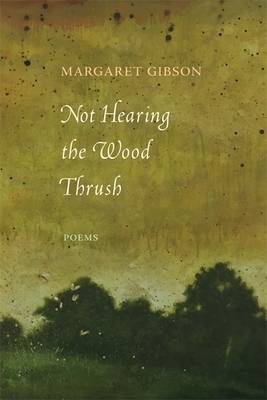 Margaret Gibson is the author of twelve collections of poems and one prose memoir. A native of Virginia, now a resident of Preston, Connecticut, she has received numerous honors, including the Lamont Selection, Connecticut Book Award, and Melville Kane Award. Her collection The Vigil was a finalist for the National Book Award in Poetry.